SCVHistory.com | Mojave Desert | Linda Castro: Shoshone Town - A Great Pit Stop, 2017. Shoshone Town: A Great Pit Stop. SCVNews.com | Thursday, February 16, 2017. Are you planning a trip to Death Valley soon? While there are many great places to visit and interesting things to see in the park, I encourage you to make a stop on your way to the park – and it does not even require that you take a different route. About an hour north of Baker along Highway 127 lies the town of Shoshone. There are several interesting things to see and visit in this tiny town with a population of 31. First of all, the town has a museum where you can learn about the area's geology, environment, people and history, spanning from the time of prehistoric animals through Native American culture to mining, farming, bootlegging and more. My favorite museum exhibit is an interesting archaeological find: the museum features the skeletal remains of a prehistoric mammoth found near Shoshone. It also carries a great selection of books about the area's geology, history, Native Americans and natural history, flowers and wildlife. 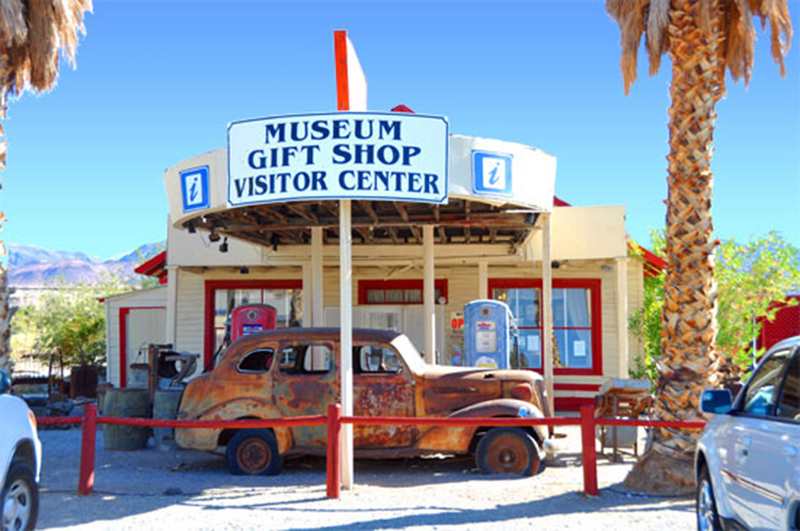 Although this museum is located in an unlikely place, I think it is one of the best museums about the desert. Another interesting place to visit is Dublin Gulch ghost town. It's down a short dirt road next to the town's historic cemetery (which is also worth visiting). 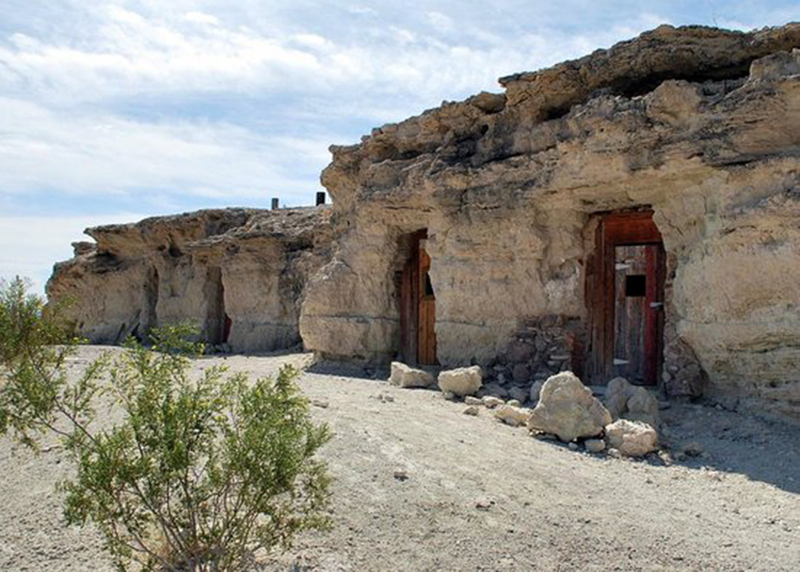 In the early 1900s, miners and railroad workers carved out living quarters in the cliffs near Shoshone. The cave dwellings served two purposes: to escape the extreme summer heat and to insulate people from the freezing Mojave Desert winters. The caves line both sides of a dirt road about a half mile off of Highway 127. The best-preserved caves are on the right side. Most of the cave dwellings have only one room. One of the more extravagant dwellings has several rooms plus a garage. Several caves were heated by fireplaces. Stove pipes can still be seen protruding from the top of the bluff. Most have padlocked doors to keep out vandals. If you take the time to explore the area, you can find several cave dwellings that you can enter. Dublin Gulch was inhabited off and on until the mid-1970s. Miners, hobos, hippies and derelicts all called these caves home. When one person moved out or died, another moved in. If you enjoy birdwatching, the town of Shoshone is a great place to do that. The town holds wetlands that attract a wide variety of birds, such as the crissal thrasher and loggerhead shrike that live there year-round, and the yellow-breasted chat and blue grosbeak that breed there in spring and summer. There are several short bird-watching trails throughout the town. Finally, you can visit waterways that hold a small fish that was once declared extinct. The Shoshone pupfish, a subspecies of desert pupfish that lived in springs along the Amargosa River near the town of Shoshone, was declared extinct in 1970 after repeated surveys failed to find any of the tiny fish. In the mid-1980s, biologists were surprised to find a population of pupfish in a drainage canal that closely resembled the Shoshone pupfish. Those biologists tentatively declared the subspecies "rediscovered" in 1986, although there is a chance that what they found was actually a new population of the closely related Amargosa pupfish. The researchers behind the 1986 study figured earlier surveys had failed to find holdout fish surviving in a patch of reeds near the outflow of the Shoshone Springs. By the time the fish were found, they had rebounded in numbers and started frequenting more open water near the marsh. Since then, the fish have thrived under the watchful care of Susan Sorrells, the owner of the town of Shoshone. Sorrells has created pathways along the waterways where the pupfish now thrive, so visitors can watch the pupfish "up close and personal." Many people drive through the town of Shoshone on their way to Death Valley National Park every year, not realizing the many treasures the town holds. If you have not stopped there before, you definitely should do so. 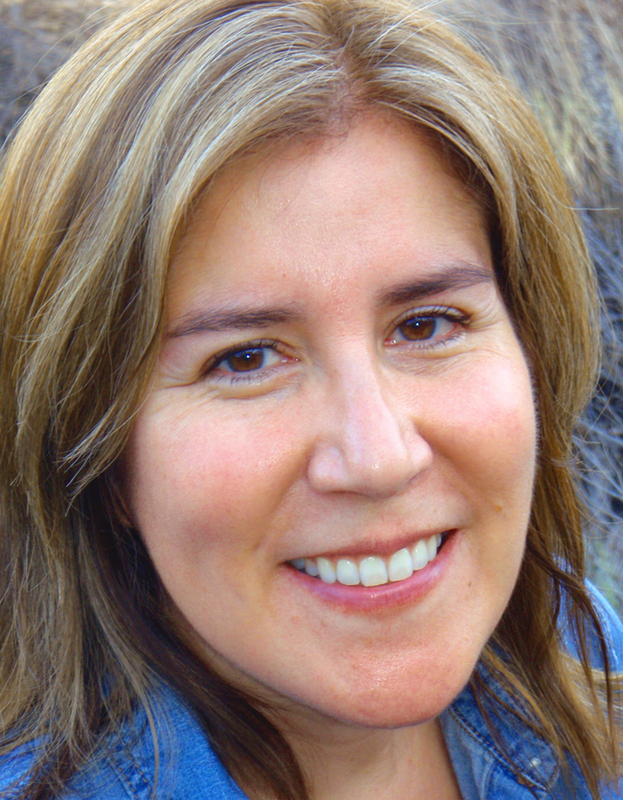 Linda Castro is the Desert Field Organizer for the California Wilderness Coalition and serves on the board of the SCV-based Community Hiking Club.